"Tasty cookies with a protein supplement, perfect for people who work out and are grossed out by protein shakes. Can substitute flavored supplements for a fruity twist." In a large bowl, cream together the butter, peanut butter, brown sugar and white sugar until smooth. Beat in the eggs one at a time, then stir in the vanilla and water. Combine the flour, protein powder, baking soda and salt; stir into the creamed mixture. Fold in chocolate chips. Drop dough by heaping spoonfuls onto un-greased cookie sheets. Bake for 10 to 12 minutes in the preheated oven. Allow cookies to cool on baking sheet for 5 minutes before removing to a wire rack to cool completely. 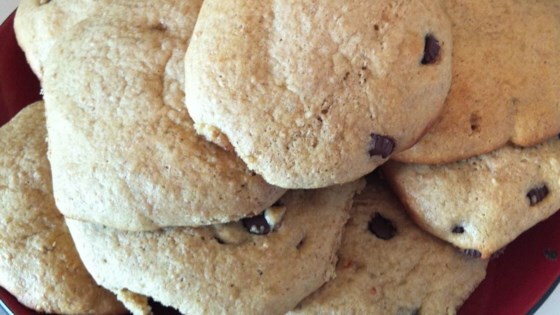 Peanut butter and chocolate chunks make these chewy cookies addictive. make sure the protein powder has no noticable taste. Otherwise this is a great cookie! great cookie. made some changes. i used milk instead of water. used 3/4 cup peanut butter (crunchy)and added a cut of coconut. i only had strawberry protein so i used that. yummy! !